Being a single mom is very hard, stressful, and depressing. Being a single mom and working is even more stressful and depressing. Work causes stress, and being a mom also causes stress so you feel so stressed out and don’t know what to do or where to go. You get so desperate that you feel like you are all alone and don’t have anyone to help you or cheer you up. You feel like your not a good parent because you have to work enough hours to get enough money to pay bills and take care of your child. I am here to tell you that you’re doing a GREAT job and keep up the good work!! I know exactly how you feel because I am going through it myself. 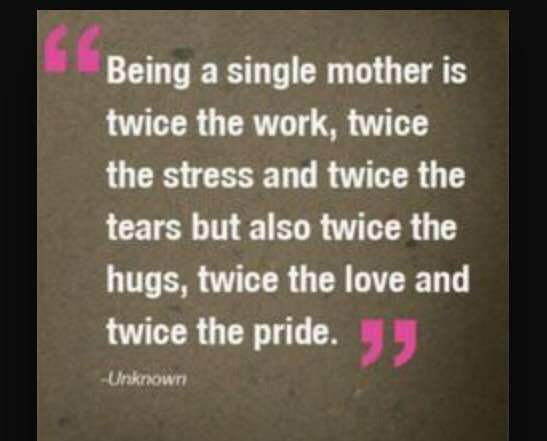 I am a young single hard working mom. I am my daughters mother and father. Alot of times I get out of work so tired that I just want to lay down and sleep my life away, but then reality hits me that I am not able to do that because I have to take care of my daughter first and put her to sleep before I can get some rest. Most of the times I feel like I’m stuck in between these four walls and can’t get out. But then I think of all the help I get from my family and how lucky I am to have that help. Never feel alone. There’s always someone out there willing to hear you and give you advice. Never feel like you are not good enough, because you are. Keep working hard even if you feel like giving up because “Hard work pays off”. Give all the love you can to your child because they need to feel it. Never give up, strive to do better in life for you and your child because in the future that child will thank you for never giving up on them. Being a young parent has really empowered me. All of the statistics and stereotypes can really make a person inferior. We don’t finish high school or we just live off of government assistance. Going through everyday routines of having people stare at you as if you don’t have a right to be a parent. An older lady looks at me and says “I know that’s not your baby”. Over the last six months I’ve reached some goals that at one point were impossible to me. I now have a steady job and still making money doing things I love to do. I now have the means to move out on my own and provide a home for my son. I feel as if I can be a role model to others and set an example for those who may feel as if things may never get better. I felt that I would never be able to crawl out of the barrel that I sat down in… without realizing that I may not have a way out. The support from my fellow ambassadors and other young parent advocates helped to push me to get up and change things for the better. With that being said, I’ve realized that every parent is different. The fact is that being young parents is our “normal”. Being a woman of color on top of being a young parent makes life even tougher. I was born with a preconceived thought of what I would become. My mother was a teen parent and I’m a young parent. That’s why I’ve made it goal in life to educate young parents around the world. And we must stick together and fight this war and set an example for those who will inevitably come after us. There are many things in my life I feel I can’t control, one being depression. I remember it started when I was 13 years old. About once or twice a year I would get really sad for a few weeks. I wouldn’t get hungry I wouldn’t want to get out of bed I just wanted to be alone. I hated feeling that way because I couldn’t find a reason for me to be depressed. I remember when I was 14, I missed school for a week. I was so far behind in school and my teachers didn’t know what was going on. They only gave me the work and told me to get it done if not I would have stayed back. This was very frustrating and made things worse for me. My family doesn’t believe in psychology or therapy for depression. They believe that is an excuse to act up or to make people feel bad for you. It was hard because I had no one to talk to about it and that was hard. When I was depressed I had to fake my happiness and since I didn’t live with my parents they didn’t notice when I missed school. They didn’t notice when I was depressed or in need of their help. Even though I went through all those things. Dealing with it on my own did make me grow stronger and more independent. But I realized that even though I had to control over my depression I wasn’t going to allow it to control the way I lived life. I learned to live with it and for some reason I don’t even notice when it comes back. I feel fine now and now, more than ever, I have a reason to be ok. My little boy keeps me happy alive and helps me remember that I can have some control. I can choose how I live and how I love.